When creating a giclee of a painting, the first step is to create a high resolution digital image of the painting, and superior scans yield superior prints. By direct-scanning a painting, we are able create first generation files. After extensive research of oversize scanning systems and digital camera backs, we choose the German-built Cruse scanner. We are one of few select U.S. giclee printers to install this premium scanning system. Other installs include such locations as the Beethoven Museum in Bonn, Germany, the Vatican's Secret Archives and NASA's Johnson Space Center in Houston, TX. Our scanner is the system of choice for reproducing artwork, rare documents, maps, artifacts, books, etc. It is designed to handle paintings up to 4" thick, so scanning stretched canvas paintings is no problem. Our scanner accommodates sizes up to 36" x 48", or larger if tiled. Direct scanning provides precise surface detail and color information. In fact, we have reproduced several paintings considered "too difficult" to reproduce by other shops. The image above is a scan of a watercolor painting sent to us for a L.L. Bean catalog. The designer was unhappy with drum and digital camera back scans purchased elsewhere. The painting was shipped to us, we scanned and returned it the following day-without problems. The agency was quite pleased with the scan noting it catpured the subtle detail and color information they needed. The file was used to produce the cover of a winter L.L. Bean catalog. 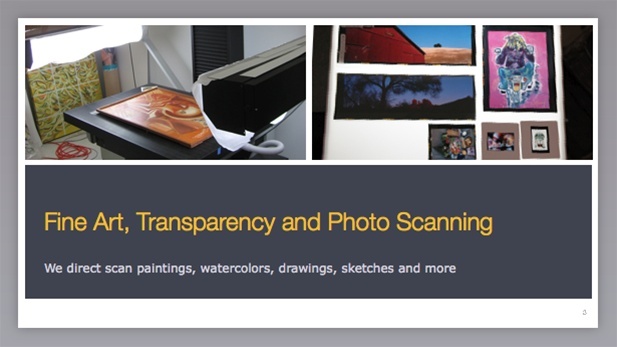 Our scanning prices are comparable or less to having a transparency made by a photographer and then scanned.